Nothing says “summertime fun” like an inflatable water slide. These creations add wet thrills to any outdoor event, from small backyard parties to festivals and corporate gatherings. 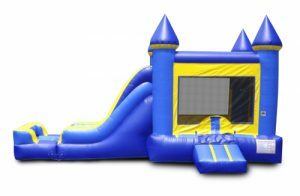 Inflatables spawned from their bounce house cousins, and use the same materials and construction methods as commercial-grade bouncers. Most inflatable water slides feature a climbing ramp or ladder and a splash pool at the base of the sliding lane. A stylish new addition to the lineup of water slides is the “marbled” look. This exclusive vinyl printing process gives the slide body the appearance of stone, lava, or even crashing ocean waves, and provides a dazzling look that is sure to create lasting memories. Let’s take a look at some of our favorite marble water slide models below. Available in two different sizes to suit events of all types, this towering waterslide features a single extra-wide slide lane and a climbing ramp mounted alongside it. At the base of the slide body, a full-width splash pool is ready to add cooling fun on warm summer days. The body of the unit is decorated with a marbled vinyl, giving it the appearance of frolicking ocean waves. At the top of the slide and along the high bolstered sides of the slide lane and climbing ramp, the vinyl material has been sculpted to add even more visual interest. The result is a commercial-grade water slide that looks amazing and performs beyond expectations. Towering overhead at 20 feet at the top arch, this incredible inflatable water slide offers dual lanes for added thrills. A centrally-located climbing ramp takes riders to the top, where they may then select which flanking lane to zip down. Each slide lane has its own splash pool with high bumpers. The slide body is decorated with marble-printed vinyl, this time in shades of fiery red and orange to give it the look of hot lava. Like something out of a fantasy novel, this double-lane inflatable water slide is sure to put smiles on young faces. It is decorated with printed vinyl in shades of cool gray, white, and black, giving it a stone-like appearance. The arched slide tops add visual interest. Each of the two slide lanes flanks a central climbing ramp, and both lanes end in their own splash pools at the base. For summertime events, nothing beats a giant water slide for cooling fun. This popular inflatable water slide model offers a lot of fun. We’ve styled it to look like a towering wave, complete with a decorative curling wavetop over the dual slide lanes. Each lane is extra wide. Alongside the dual lanes, a climbing ramp makes getting to the top as easy as possible. The splash pool spans the width of the unit. The printed marble vinyl of the slide body adds an even more ocean-like appearance, with shades of cool blue and white to finish off the design. This model stands 22 feet high at the top of its decorative wave. At 24 feet high and stretching out 67 feet in length, this is one of our biggest commercial-grade inflatable water slides. It features a wide single-lane slide that takes riders to a long slip ‘n slide area before ending up in the generously-sized splash pool. The slide body is decorated with marble-printed vinyl in shades of ocean blue, and there’s even a cresting wave at the top. The slip ‘n slide area has arches overhead to add stability to the inflated unit. The three piece unit is easy to set up, and is the perfect choice for larger outdoor events.